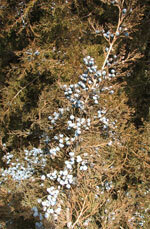 Eastern redcedar is the most widely distributed tree-type conifer in the United States. The western boundary of its range is the western borders of the Midwestern states. It grows from the Great Lakes down to the Gulf of Mexico and to the eastern seaboard of the United States. Hardiness Zones 2 to 6. In its native range this tree can grow from elevations of 100 feet to 3,500 feet, but can grow up to 7,000 feet in Colorado. This tree likes full sun exposure and is intolerant of shading. Growth habit Pyramidal growth habit with dense foliage when the trees are young. As the trees mature the crown can open up giving the tree a more open pendulous appearance. Height can be up to 35 feet at maturity with a spread of 20 feet in Colorado. Foliage Needles can be both awl-like and scale-like on the same tree. Foliage color is dark green in the summer turning to a rusty brown color in the winter months. Fruit Female and male flowers are not on the same tree. Following fertilization berry-like fruit can be up to ¼ inch in diameter with one to three seeds inside. Fruit is blue to purple in color with a whitish cast as they mature. Fruit matures in one year. Bark and twigs Bark on young twigs is smooth but quickly begins to exfoliate into long thin strips. Color is light brown to gray. 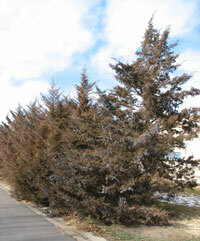 Insects and diseases There are no major pests associated with this tree in Colorado but minor pests could include aphids, spittlebugs, spider mites and rust fungi. Landscape value Because of this trees wide distribution within the United States it has a wide tolerance of temperatures and soil types. In the West it is tolerant of drought, high clay and slightly alkaline soil conditions. 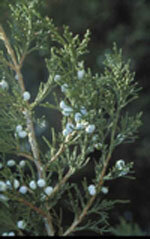 There are numerous cultivars of this species with various forms, foliage color and size ranges to choose from.